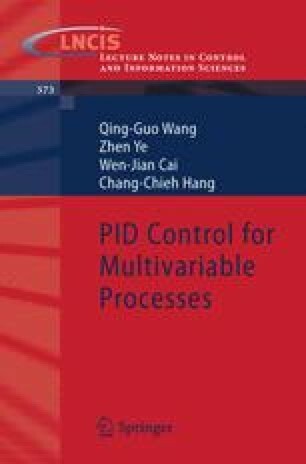 In the previous chapter, an IMC design method is presented for decentralized (multi-loop) PID control. Next, Chapters 6–7 will address design methods for centralized (multivariable) PID control, where this chapter mainly considers the dominant pole placement design. There is no easy way to guarantee the dominance of the desired poles if time delays are present in the loops because a continuous-time feedback system with time delay has infinite spectrum and it is not possible to assign such infinite spectrum with a finitedimensional controller. In such a case, only the partial pole placement may be feasible and hopefully some of the assigned poles are dominant. In this chapter, an analytical PID design method is firstly proposed for continuous-time delay systems to achieve approximate pole placement with dominance. Its idea is to bypass continuous infinite spectrum problem by converting a delay process to a rational discrete model and getting back continuous PID controller from its discrete form designed for the model with pole placement. Then, simple and easy methods are also proposed which can guarantee the dominance of the assigned two poles for PID control systems.